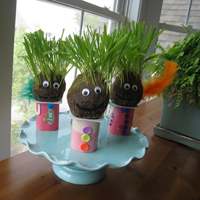 Looking for something fun and eco-friendly to do with the kids for Earth Day on April 22? Try out these super cute Earth Day guys! It’s like the Chia Pet for kids! 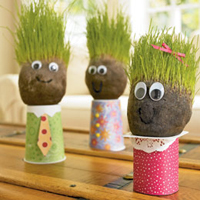 Each child can grow his or her own Grass Head Guy by checking daily on its water and sun requirements. Hair getting too long? 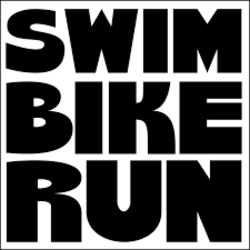 Give them a trim or a crazy hairstyle! 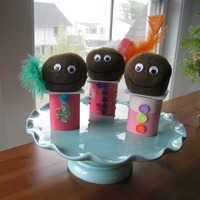 This is a great craft that will keep them interested for months to come! Spoon the grass seed into the stocking foot, and the potting soil on top of the seed. Tie a knot in the stocking, leaving the excess fabric hanging. Fill a yogurt container halfway with water and place the stocking head on top with the nylon tail in the water to serve as a wick. Attach googly eyes to the head and draw on a mouth with permanent marker. To decorate the yogurt container, tape on clothing made from card stock or other materials. Be sure to check the water level in the yogurt container every day, keeping it at least half full. Previous PostHow do I dispose of this? Find recycling options near you on Earth911.com! Next PostTime capsule your spring break! DIY “Vacation in a Jar” momentos are so cute!